The two largest London agencies are hoovering up women conductors. Askonas Holt today signed Corinna Niemeyer, assistant conductor of the Rotterdam Philharmonic Orchestra. A protégée of Francois-Xavier Roth, she has been conductor of the University of Strasbourg orchestra and was appointed six months ago assistant to Lahav Shani in Rotterdam. Not many assistant conductors get snapped up this fast. That smacks of low standards, rank opportunism, and greed. The business of classical music constantly savages the art of classical music. It’s like the “period instrument boom,” completely without artistic basis, but a way to make more money. Never mind that it ruined the performance of baroque and even classical music, which had reached its peak in the 1980s. And how did it do that?? I don’t agree with you in matters of this conductor, but I do when it comes to the period instruments. It annoys me to no end that nowaday everything baroque must be plaid on impure sounding wind instruments and with low tuning. Especially with Bach – and I do love Bach – it gets on my nerves. Bach was always searching for better instruments, he worked with Gottfried Silbermann and he loved the development in music. I think this odd form of “nostalgia” goes against his spirit. He’d probably have been delighted about the brillant sound of a modern orchestra and wouldn’t understand why people decide to ignore improvements on instruments. No surprise. If it was a male conductor, there would have been no chance. You mean, no chance of all these gender-based negative comments? I agree. Big rush because women conductors are “the thing” right now. It’s no longer just on ability these days. Your comment is obnoxiously misogynistic. I am sure the maestra’s ability far exceeds yours, not only in music. Back to your cage! Except you know he’s right, and that’s why it makes you so angry. How do you know she wasn’t appointed on ability? Because she’s a woman. DUHHHHH. “hoovering” them up, like dust balls in the corner. Winning a competition let alone a job is getting very hard for a middle aged, sexist white male conductor. It may be time to move to Sweden and get that operation done once and for all. A couple of nice touches with pacing right at the beginning of the excerpt. And I like how she trusts the principal clarinet to play the solo and only conducts the strings (a little) to keep things together. Micromanaging well-known solos (I promise you, the clarinetist has known that solo since s/he was a teenager) is one mark of an inexperienced and/or insecure conductor. 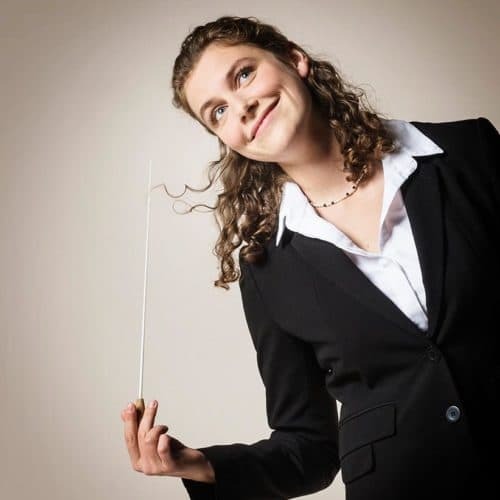 I find it incredible, seeing the comments in the latest articles on signings of young conductors by Askonas Holt: all three very highly competent musicians, with clearly defined talents and personalities. Two of them women, one of them a man. The comments about the man are incredibly superficial on the level of discussing things that have nothing to do with his conducting, but on the articles about both women, it is immediately shocking because women conductors are considered a “fad” and “have no ability”. These comments, of course, written by people that for sure haven’t even seen or heard any of these young maestros conduct and probably assume that a beautiful woman can’t have anything between their ears but air. PS: the correct term for a conductor in Italian, regardless of gender, is “maestro”. Maestra is just a school teacher. She gained some prominence when she conducted the musical interludes during the funeral ceremony for Helmut Kohl in the European Parliament in Strasbourg, almost two years ago. In front of Macron, Merkel, May, Clinton, Netanyahu, Berlusconi, Major, Sarkozy, Prodi, Aznar, Juan Carlos I, Medvedev, and dozens of other past and present heads of state!